Last weekend, thousands let them themselves go to the music at the Ozora festival, in a 24 hours long ceremonial opening by Goa Gil. The man is an electronic music legend yet his story is mostly unknown. From San Fransisco to the Indian beaches, he wandered on a long troublesome but spiritually enriching path. The guy we nickname “music baba” is the founding father of a rave philosophy that is still spreading. At 64 years old, Goa Gil is an historical figure: one the oldest DJs in the world but also one of the most effective. His speciality: hallucinating twenty four hours sets, on tape, using hi-tech, dark psy and all the craziest sounds in psytrance music. The last one was the Ozora opening performance on July 30th, this picture probably describes it better than any words. The artist – who is also a sâdhu (a saint in sanskrit) – dedicated his life to “raise awareness through music”. It is in that quest, between the 70s and the 90s, that he and his companions shaped the spirit of the modern rave in the continuity of the hippy movements. Their model was an inspiration for many, like the Boom Festival, Burning Man and legions of other ravers around the world. Let's start smoothly with a seven hours mix recorded in Goa in 2000. Goa Gil's story begins in San Fransisco in the 50s but his adventure really starts in 1967. He is 17, his name is Gilbert Levey and he is putting up posters for a living. 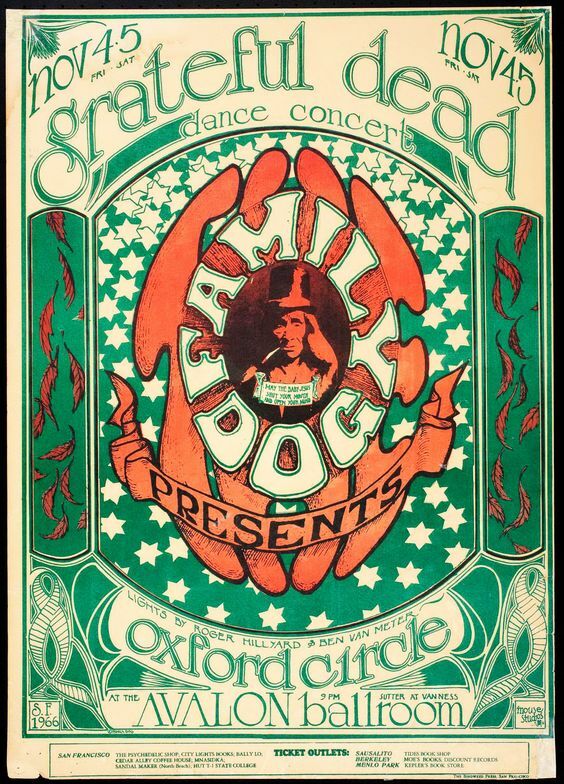 He does that for a legendary gig in San Fransisco: the Family Dog, where groups such as Santana, Velvet Underground, Jefferson Airplane or Grateful Dead used to perform. He lives in that 60s/70s rock universe, surrounded by artists like Steve Miller, Jimi Hendrix, the Beatles or Janis Joplin - “who was a good friend”, amongst many others. "I was in the right place at the right time, as I got to see most of the well-known musical artists of the time performing live, from The Beatles, The Sone, Pink Floyd and Sid Barrett, and on and on and on... All of that is part of my history, and part of who I am. It also helped to shape my musical tastes". Gil feels that the positive energy that made San Fransisco what it was, is slowly leaving: “All the magic that was there since 1965 met an abrupt end in December 1969.” A few months after the Woodstock climax, a black man dies, stabbed by a Hell's Angels biker at a Rolling Stones concert in Altamont, this marks the last times of the peaceful atmosphere carefully created by San Fransisco artists. It does not take more to Gil to go on his way to find this “magic”. He is 18 when he heads to India, the perfect destination for all the dreamers, pacifists and all the party goers of the Western world at the time. He remembers : “I bought a one-way ticket to Amsterdam then I went through Europe to Morocco, from there I went across Noth Africa.” From Istanbul, Gil took trains and buses through Turkey, Iran, to end in Afghanistan. “I only paid 30 dollars for the transport, food and hostels! It was really cheap at that time in 1969.” In Afghanistan, he meets an Englishman who becomes his travelling partner. “He had already been to Goa a year prior to our trip. He told me about the fabulous and deserted beaches... So I decided to accompany him to Goa. We went from Kabul to Karachi and from Karachi we got a boat to Bombay then another to Goa”. Once in Goa, Gil was delighted to meet Eight Finger Eddie, maybe the first-ever Freak in Goa. On Anjuna beach – which was soon to host the Full Moon parties –, he only stays in Eddie's house “a little house where a crew of Freaks were staying and a few indians hanging out.” After two weeks, our hero decides to set sails to new destinations, leaving his new found friends behind in Anjuna. He hitchhikes and walks down the coast of Indian and then up the other coast. In Puri he meets an Aghori Sâdhu who speaks english, and with him he continues his journey. They go to Calcutta and then to Benares, the holy city in Hinduism. Eventually after visiting Nepal, they go to Kashmir for "Amarnath Yatra": the pilgrimage to Shiva's Cave in the high Himalayas. They stay in Srinagar in a temple full of Babas who are going to Amarnath. The head of the place, Mahant Swami Nirmanaland, gives Gil his first initiations. One of his 5 Gurus is Mahant Primi Giri Ji Maharaj who became his main Guruji after the death of Swami Nirmanaland Ji. At the start of 1971, Goa Gil, now named Baba Mangalanand, takes part in Khumba Mela – a pilgrimage that gathers several millions believers. “There, in our camp at Juna Akhara, I was given further initiations, shaved my head and had a mystical experience that anger me forever". "After the Kumbh Mela I went to the Himalayas, to seek out a great Yogi I had head of at the time, to request some teachings." After making his way to Delhi, Mangalanand (aka gil) makes his way to Goa. “When the universe gives me hints, I try to follow them. I am living my karma... My Destiny if you prefer.” “When I got back to Goa, things had changed! There were more people and small gatherings around bonfires on Anjuna bech nearly every night. People played on drums, flutes and guitars, and I played too. It was a really powerful experience, as due to my higher meditations in Himalayas". Music came through him, giving "blessings" to all who listened: "It was then that I understood the power of music as a tool to transform consciousness and empower people through it's Blessings, and even to take the audience to high states of being". In 1974, one of Gil's musical collaborators of the time, Fantuzzi and his Butterfly Family published a small booklet of poems, drawings and son including one from Mangalanand and give the credit to Goa Gil. "In those days people hand names like that, there was Amsterdam Dave, Kashmiri Robert, Bombay Brian, etc... And since i was Gil who stayed in Goa, I became known as Goa Gil, and the name stuck ! This was long before the techno and trance music started. It was still in the time of acoustic music, even before the parties". Gil discovers the transcendental and unifying power of music, he organizes his first parties and settles for the stage name of Goa Gil. He sees music like a way to “to go into a trance” and the party as “a suitable vehicle to transmit ideas and knowledge.” Music is not electronic yet but the basis of the rave concept are here. Throughout the 70s, Goa's beaches fill up with tourists that end up settling in. It is the birth of a powerful counter-culture. The ocean, palm trees, dolce vita, jam sessions around the fire, beautiful sky and of course... drugs. Western preoccupations could not be further away. In Goa, visitors confront their ideas and their creativity to the Indian spirituality. Goa Gil is one of the best examples. The party hedonism mixes with piety and spiritual questioning. Psychedelic culture will feed on that mix like nothing before. As of today, Indian culture still has a major role in the psychedelic world. Thanks to Goa, aum, chakra, karma are now embedded in the ravers' vocabulary. According to Gil, “Goa turned 100% electronic in the 80s” thanks to new comers “like the French, DJ Laurent and Suiss DJ Ruedi, who were among the first ones to mix electronic music in Goa”. In his mix, he incorporates dance music and psychedelic rock. The sound may have come from the West but the atmosphere and the inspiration was from nowhere but Goa. “There were no parties like ours anywhere else in the world Goa Gil remembers as he strokes his endless grey beard. They expressed our ideas and our dreams.” It is the birth of parties with heavy basses, good vibes, dark dancefloors and fluorescent paint. Goa becomes a place for experimentation. Ravers tripping their heads off stumble upon monastic Indian sâdhus. The modern rave spirit is being shaped, the one we find today in many events around the world and that people usually associate with the Spiral Tribe. Full consciousness, letting yourself go, sharing, free party, self-organization, mutual respect, anti-materialism, all those values come together in Goa and create a ground for a new way of thinking and partying from the meeting between western tourists and the Indian people. The community gets bigger, the message improves and spreads: Goa Gil finds the magic. Their music is derived from EBM and the acid house that starts to flourish in West in the late 80s, rather it has rounder bass lines, faster rhythms and an obvious preference for mental atmospheres. In addition to the old affection of psychedelic rock for the tribal kick, the folk and sound. The first tracks they produce also encapsulate the whole Goa philosophy. They are filled with acoustic sounds or religious atmospheres that echo the community's values and its quest for transcendence and edited with effects of every kind. Vocals, prayers, mantras or philosophical texts will later make their way into trance music. The early 90s are Goa's golden age. The atmosphere is “crazy and authentic”. Everyone in Goa is swallowed in a creative and positive spiral, the region becomes a tourist attraction. The deserted place that the young Gilbert found when he first arrived is now a crowded beach that never sleeps. Eventually the utopia falls short, magic seems to be so volatile. “When the locals and local authorities understood that there was money to make out of it, they started to monitor Goa's nightlife, he proceeds with a darker tone. They then created a situation where it was not possible for us to make parties by ourselves, there had to be a local bar owner or some kind of local person involved in taking permissions." History always repeat itself. On top of that the locals start to be fed up with the permanent “boom boom boom”, and write letters o the newspapers, creating a kind of hysteria with a section of the local Catholic population about the evils of these "Hippie Full Moon Parties". In the 2000s, Goa almost became a first class tourist destination. Party goers came from all around the world to get smashed in what almost looked like conventional parties. The hippy aesthetic is still there but the spirit is slowly dying as the early bohemians of Goa start to make their way home. The government's intervention might be questionable but it made Goa the first state on GDP per inhabitant in India. The spirit and the atmosphere are not completely dead though, and it still influences electronic music and the rave culture. Ibiza is a good example but Burning Man, the freetekno movement and most of the trance festivals are also on the list. None of the above mentioned can ignore its affiliation to the Goa years and Goa Gil and his friends. Goa Gil wears many different hats. Artist, priest, event organizer, philosopher... But it is his DJ sets that made him famous. He has always pushed back the limits with ever longer sets. 12, 24 hours, sometimes even more. And everything is on tape ! But none of that would have been possible without meeting Arian McAvoy a.k.a. Nimba. The young french woman becomes his partner in music and she will never leave his surroundings. Their psychedelic all-night longs sets were not nights be missed. Together they create the duo The Nommos which has left a burning mark on the psychedelic culture. About his sets Gil explains: “Playing music is my way to worship the Universe and the Cosmic Spirit. I set up my puja, say my Mantras, plug in my hardware and the Ritual starts"
"Har Har Mahadev! Jai Ma! Jai GuruDev! Om Namah Shivaya! Om Namo Narayan", he repeated. "In the spiritual path, nothing is possible without self surrender. In that spirit I have become a servant of the Divine. I do not work for myself but for the greater good of the Universe and Life itself. If there is something in front of me, that the Universe shows me that needs to be done, I do it without question! It is my Duty". Today, Goa Gil still regularly tours around the world. Brazil, Japan, California, South Africa and few festival appearances... His schedule is quite busy but he still finds time to rest in India a few months every year. "India is my spiritual home and my spiritual family is there". Clearly darker and harder to get into, Goa Gil's music is meant to capture minds and bodies in a storm of effect, frantic rhythms and psychedelic noises. The artist sees dance as a form of “active meditation”. With high BPMs and captivating sounds, Goa Gil tries to generate intense sensations in his public. Before concluding: “The Art of Living is to be like the Alchemist. Just like he transforms lead into gold, we must learn to transform all negative situations into positive situations to make the world a better place.